Left: Sean Manchester wrote a Facebook post in response to “Vampire Hunter Meets Match Against Horror Heavyweight” (June 14, 2015). Credit: Sean Manchester/Facebook; archive.is. Right: Ramsey Campbell, who Manchester dismissed as a “writer of pulp fiction,” posed in front of his books and soon slated to receive an Honorary Fellowship from Liverpool John Moores University in recognition of “outstanding services to literature.” Credit: Paul Heaps/Wirral Globe. Photo montage by Anthony Hogg. Sean Manchester, 70, self-proclaimed vampire hunter and sockpuppeteer, has responded to Vamped’s article covering his online stoush with famed horror writer, Ramsey Campbell, 69, on the comment thread of an interview featured on Nadine Martiz’s blog, My Addiction. “Ramsey Campbell obviously has a poor memory. Seán Manchester could identify precisely the programme hosted by a young Eamonn Holmes that ran through an entire morning. The book display is quite apparent in the video, but we don’t have the programme’s name. Contact Seán Manchester and he will provide it straight away.” – B.O.S. With a zeal not uncommon among false accusers awaiting cobra-like any opportunity to strike their perceived enemy with fangs at the ready, Émilie Charlotte goes hell for leather and unsurprisingly gets it completely wrong. I can indeed identify the programme in question. The discussion with regard to Ramsey Campbell’s claim about meeting me refers to an earlier occasion than my Central Weekend Television appearance before a studio audience on 14 September 1990, which included Ramsey Campbell among its number. I did not meet Campbell on that occasion as I was the featured guest with scant opportunity to talk to any audience members. I was whisked away via the stage on which I entered. The occasion Ramsey Campbell is referring to and Émilie Charlotte has no apparent knowledge about was five months earlier on 26 April 1990 where I featured throughout the morning on BBC’s “Open Air” and did a concentrated interview with Eamonn Holmes around 10.00am. Ramsey Campbell appeared in a slot on the same morning to talk about his books that I witnessed him carefully assemble out of a case and display in readiness. However, I cannot remember any conversation taking place between us. He was totally preoccupied with arranging his paperbacks and didn’t want to be distracted, or at least so it seemed. I recounted in my journal for that day the high degree of perspiration accumulated on Campbell’s countenance which I trust was not entirely due to my presence; though I suspect the idea of a vampirologist gaining such prominence on BBC’s “Open Air” might have bothered him a touch. +B .O.S. Threatened? Quite the opposite. In fact, let me show that I bear no grudge even if I ever had a reason for one. Mr BOS, would you mind passing on an invitation to the gentleman, since I gather that you have his ear? If he is free on 13 July and can be at the Anglican Cathedral in Liverpool, I’m happy to invite him to be present when Liverpool John Moores University gives me an Honorary Fellowship. The University says it is for outstanding services to literature. Manchester’s Facebook response demonstrates he has read the article and Campbell’s offer; Émilie Charlotte’s comments were originally published on the article, Manchester just didn’t bother to cite them. But as this article went to press, Manchester has made no effort toward accepting, but did take the time to “like” Facebook posts written by “Christian England” and “Tony Hill” on June 12 and 13, respectively, the latter unfavorably comparing Campbell to Australian soap actor, Ian Smith. 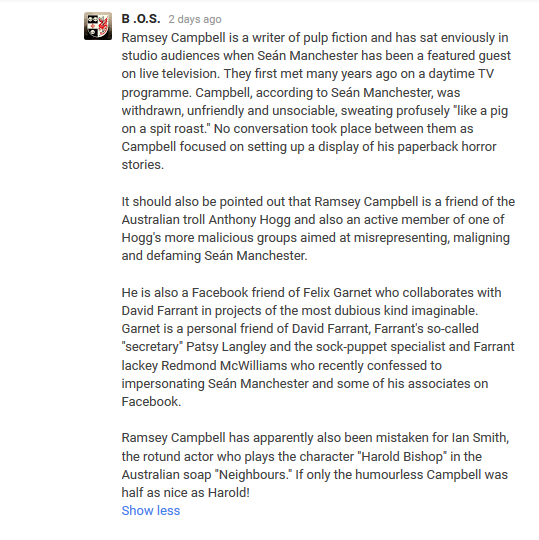 Interestingly, both Christian England and Tony Hill’s posts were virtually identical to comments Manchester wrote as “B .O.S.” on the My Addiction interview comment thread on June 10, 2015, revealing “Christian England” and “Tony Hill” are plagiarists just like Manchester—or that they’re also sockpuppet accounts employed by the self-proclaimed vampire hunter. Sean Manchester declined Ramsey Campbell’s invitation and made a counter-offer. 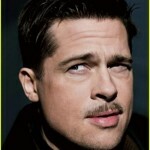 See: “Vampire Hunter Rejects Horror Heavyweight’s Meet Offer” (June 16, 2015). To learn more about Sean Manchester’s online presence(s), read our blog post concerning legal action he’s taken against this site.